Children in the IDP population of Karen state receive none of the childhood immunizations that are a primary defense against child mortality throughout the world. Absence of immunizations is one of several reasons why 138 of every 1,000 children born alive in Eastern Burma die by the age of five, compared with 14 deaths in children under five per 1,000 live births in Thailand. There also exists in this unvaccinated population the potential for a disastrous wide-scale measles epidemic. 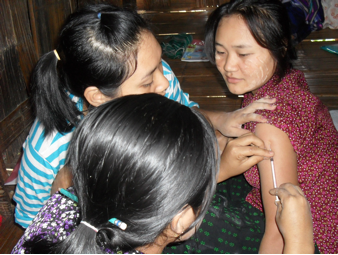 The long-awaited commencement of an immunization program (IP) in eastern Burma became possible in 2008, when the Border Green Energy Team (BGET) installed solar-powered refrigerators for storing vaccines at KDHW clinics near the Thai border. Keeping the vaccines cool to minimize spoilage requires intensive planning and training of program workers. The IP trains clinic workers in vaccine theory, storage, and administration, in disease pathology and transmission, and in good record keeping practices. With input from the clinic workers, KDHW has developed protocols to minimize the risk of vaccine spoilage when transporting vaccines from the refrigerator at a clinic to more remote locations. Community leaders notified in advance arrange for villagers to assemble at particular sites for mass vaccinations, shortening the length of time that the vaccines must be kept in unrefrigerated coolers. The solar panel provides electricity to the refrigerator shown in front in the middle picture and open in the third picture. The first six IP health workers were trained in August, 2008, and in December another twelve health workers were trained. Follow-up trainings of some or all the health workers are given periodically. Additional health workers are being trained for expansion of the program to new clinics. Children from birth to 14 years of age are immunized in sequences shown below. Clinics keep a card for each immunized child in order to track their individual sequence of immunizations. 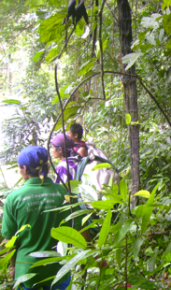 Community Education is an essential component of the IP. Parents are taught about the importance of childhood immunizations and of receiving all doses of the vaccines, and also about common side-effects. • At its outset the IP responded to a measles outbreak in five clinic areas in one district. In August, 2008, the new coordinator for the IP trained twenty community health workers in that district in MMR vaccine administration. During the month the twenty health workers immunized and gave prophylactic doses of vitamin A to 7,700 children under 15 years of age, 87% of the target population in the five clinic areas. • In April, 2009, the first round of systematic immunizations was given by KDHW in three mobile health clinic areas. • In July, 2009, the program was begun in three more clinic areas. • Vaccination campaigns are implemented every three months. As the program matures, the frequency may be scaled back to every six months. • After an area completes four rounds of immunizations, the program focuses on immunizing newborn and newly arrived children. • Due to continuing security concerns, the program has been suspended in some areas where residents had to leave their villages to escape military conflict. • By the end of 2010, two clinic areas had received the maximum seven rounds of immunization, two areas had received six rounds, and the two areas with interrupted programs had received three rounds each. • The program can not reach more distant mobile health clinic areas, because the cold chain cannot yet be maintained for longer than a three days’ walk from the border. Combined target populations in the six clinic areas and numbers of children receiving immunizations by the end of 2009 and by the end of 2010 are shown in the table below. The target populations and numbers immunized for 2010 include most children who were immunized in 2009, but children who left the area or who aged out of the programs are not included. Hence, the numbers immunized in 2010 are slightly less than the cumulative totals for two years.